Sap Brook Trail - Devil's Den is a 0.94 mile one way hike with 208 feet accumulated elevation gain. Located 11 miles west-northwest of Bridgeport Connecticut. May and September are the best months to enjoy this hike. Overview: The Sap Brook Trail connects the Pent Trail (post #9) to the Godfrey Trail (post #39) just above the portable sawmill ruins. It passes the junction of the Hiltebeitel Trail (post #38). 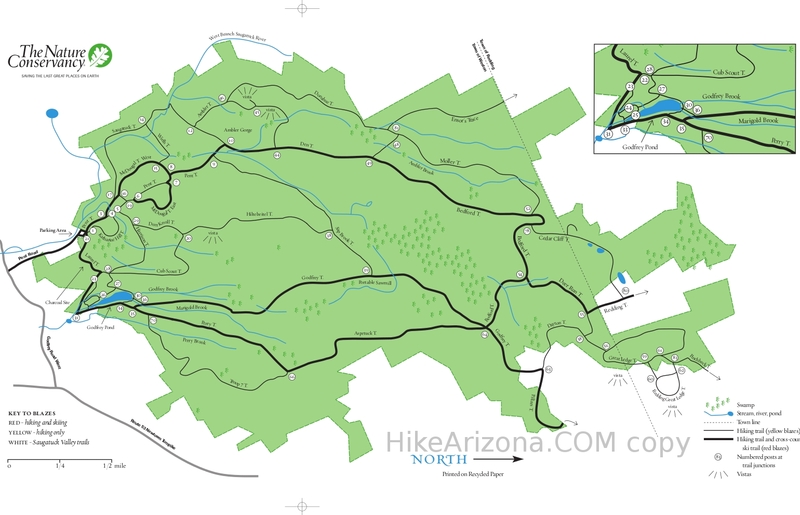 A key trail used to make a loop of abou 3 miles. Check out the Official Route. No fee, however you must take a free map from the kiosk as your permit for hiking in the Nature Conservancy Devil's Den Preserve. From the Merritt Parkway (CT-15) take Exit 42 and proceed north on CT-57 for 3.8 miles. Bear right at light onto CT-53 and proceed 1.7 miles. Turn left on Godfrey Road and proceed .5 miles. Turn right onto Pent Road (note Nature Conservancy sign). Follow to end of road and trailhead parking lot. GPS address: 33 Pent Road, Weston, CT.